Maybe it’s finally time to let them go. Especially because I just about implaled my foot on some particularly crunchy grass the other day. Texas is so great. Even the grass attacks you. I think the Tucci’s will have to step in and take over everyday riding duty until we go to Europe, because I’d rather get replacement boots there. I can get the Ego7’s for about $300 instead of $500, which is obviously much more appealing. Plus then I could be the weird girl that wears her tall boots home on the plane, since they’re unlikely to fit in my luggage. Win-win. Ok, so I still have to actually measure things out and set them up. And find a good, fairly flat (ish. kinda.) spot for that. But in theory I have a dressage ring now. Ish. Kinda. 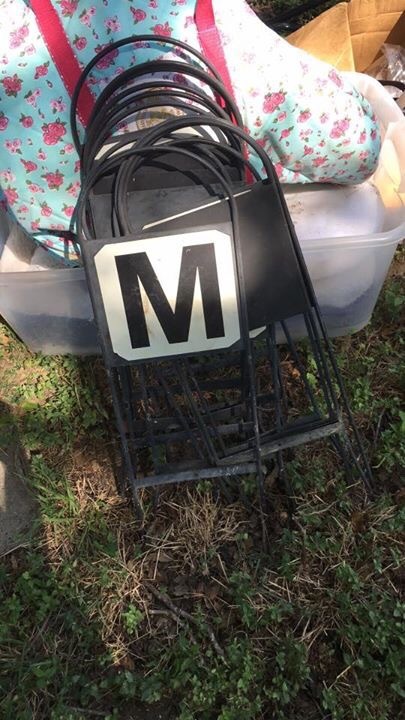 On my way back from picking up the letters, I stopped at Dover to pick up a dressage whip. I figured that since I’ve been using one now for like a month, it was probably time to graduate to Big Girl status and buy my own. Their selection wasn’t great, and who knew dressage whips were so expensive (at least at Dover, they were all $30-70! ), but now I actually own one. The cheapest, ugliest one they had, but… still counts. This is a landmark moment in Henny history. Okay, Dover, you’ve earned back like .005% of my respect. Of course, it was $3 more than it is anywhere online, but in the realm of Dover that’s not bad markup. And not only is it weanling size, it’s the one with ears and the long nose. In theory, it could protect Presto’s little pink nose. In reality, I’d be shocked if the mask stayed on for more than 5 minutes. It’s the thought that counts though right? Helpful hint- when shopping at the Dover brick and mortar store always check online on their sale and closeout sections. I saved $45 the other day buying stuff on store that wasn’t actually on sale, but was on-line. They will price match but you have to tell them. Makes the in store prices much more competitive! This makes me hate Dover more. They always have several different prices on things. Yup. I unfortunately have to shop there occasionally, bc I have one 20 mins from my house. But yes, it is ridiculously annoying to walk around the store with my phone price checking everything 🙄🙄. I’m honestly a little dubious about the ones I bought (HKMs… So. Ya know. Questionable quality). But the size chart made it seem like they might actually fit my borderline not-off-the-rack size specs, since my left leg (the one I broke) changed shape and doesn’t want to fit anything any more. The HKMs are supposedly taller than the mondonis too. We shall see! Baby fly masks are basically the cutest 😍 I still have Cinna’s stashed away somewhere haha. I once bought a crop and a dressage whip on Amazon and the reviews were…interesting. Let’s just say that not everyone who buys crops on Amazon is a horse person. Score on the dressage ring! RIP boots. 😦 Return the whip, life’s too short to keep overpriced, ugly crap. Just the other day my mom was asking if the local Dover was still in business, she was shocked that they were since she remembered them as snobby and overpriced. Congrats on the letters & the fly mask! 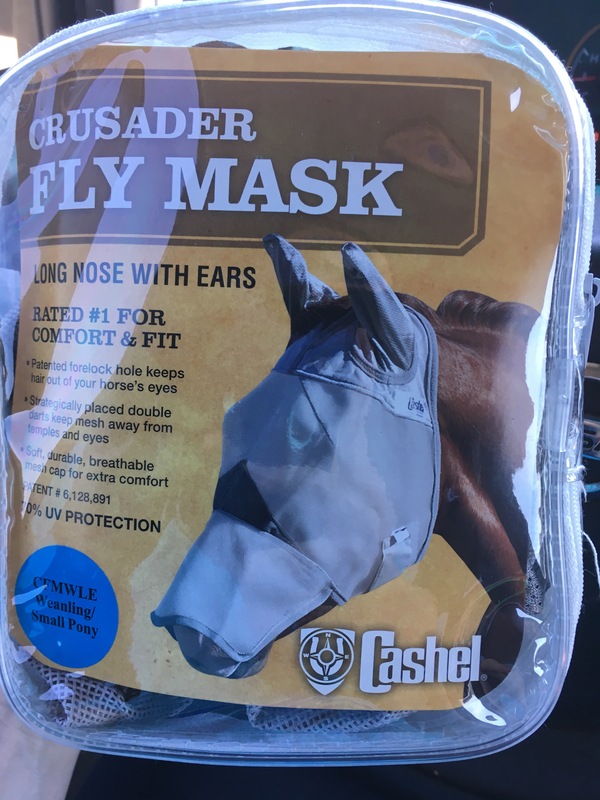 I got Joey’s fly mask on eBay because I’m super cheap like that. New in package for $10. Yes please. Especially glad for that price since it’s already torn…and ends up trampled often. I think/know the other colt drags him around by his mask…lol. 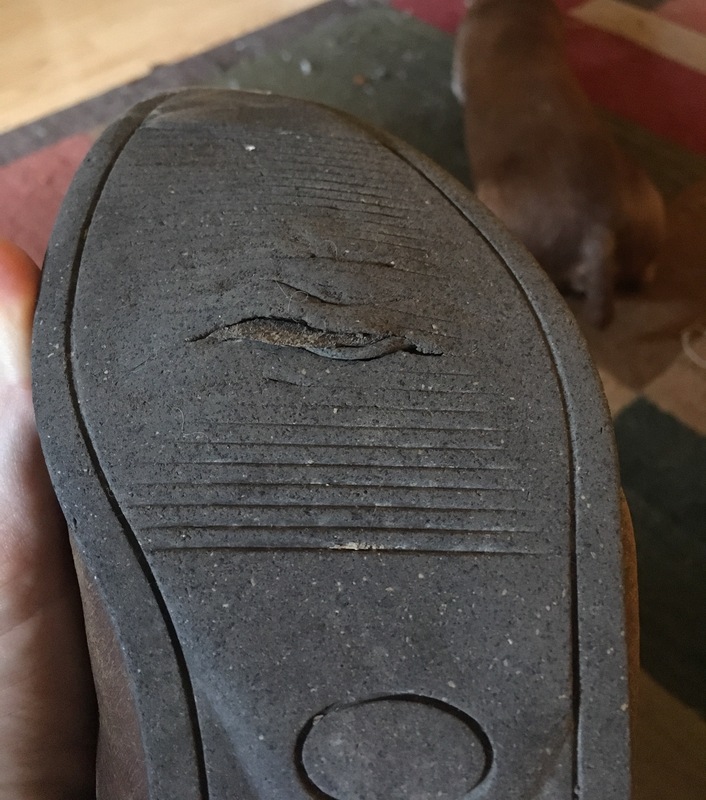 This may be a very Texan sort of thing to suggest but have you looked into boot repair places to see if you could get them resoled and lined? It might not be cheap but it might be cheaper than a new pair. I got that gel whip from Dover, but mine was blue. Absolutely my favorite until the gel broke and leaked all over and ruined my gloves. But I still kinda want to get another one despite all that. It’s just so nice to hold. Yeah the one I was borrowing was a black one with that grip and it just had the perfect weight and feel to it. Dover did have a blue one like it, but it was $40, so I’m assuming it was a different brand? The blue one I bought was like $20, but it probably was a different brand. I should add the RW to my next order. Hooray for all the new things! Sad face about the boots tho! At least they had a somewhat long life! Holy cheap Ego7s! If you had four legs I’d have you bring me back a pair! As much as I adore RW and order almost exclusively from them, the Dressage whips bear an extra shipping charge. I recently bought the gel handled one, which hasn’t leaked so far, but shipping was still an issue. Yeah they do, which is why I figured I’d buy in person at Dover. Granted, the one from RW would have STILL been cheaper, even with the upcharge for shipping. Lesson learned.